The monument commemorates those from Hamilton who enlisted in World War One. The Hamilton Town Council proposed erecting a memorial at Cameron Rocks as a memorial to the soldiers who left the town to fight in the Great War. The project was started during the war but the Council was prevented by Commonwealth edict from raising money. It remained in abeyance until 1922, when the Mayor Alderman C.M Jenkinson received further donations. In 1924, there was enough money to start but not complete the memorial. It was planned to erect a pagoda in the form of a Victoria Cross surmounted by a tower with a four face clock with a water fountain installed in the centre of the pagoda. 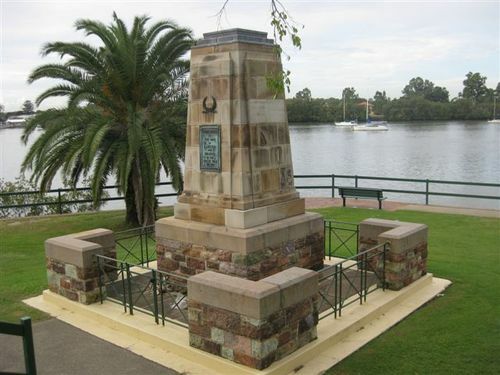 The memorial was unveiled in its present form by the Governor of Queensland Lieutenant-General Sir John Goodwin on the 16th August 1931.